The original Black Square (1915) today hangs in the Tretyakov Gallery in Moscow on Krymsky Val. Researchers find color image hidden beneath Suprematist masterpiece. 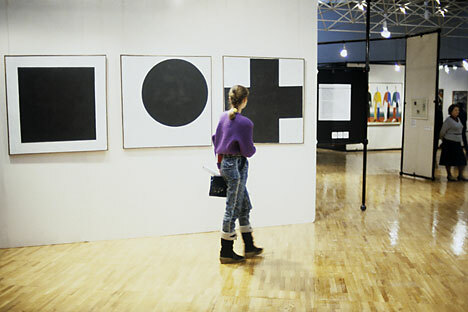 Moscow’s Tretyakov Gallery has published the results of the latest research carried out on Suprematist artist Kazimir Malevich’s revolutionary avant-garde painting Black Square. It turns out that a color image is hidden beneath the painting – and not one, but two. The discovery was made just over a month ago. "It was known that there was some underlying image beneath the image of Black Square," said Yekaterina Voronina, a researcher in the Tretyakov Gallery's department of scientific expertise. "We found that there was not one such image, but two. And we proved that the original image is a Cubo-Futuristic composition, and the one lying beneath Black Square, the color of which is visible in the craquelure, is a proto-Suprematist composition." In the X-rays, the outlines of Malevich's other painting are clearly visible on Black Square. Under the microscope, it can be clearly seen that another layer of paint shines through the craquelure, i.e. through the cracks in Black Square. The authors of the research – the Tretyakov Gallery's Voronina, Irina Rustamova and Irina Vakar – also spoke about their other discovery: They have deciphered an inscription on Black Square that they consider to belong to the author. More precisely, they have almost deciphered it: Three letters are missing. "Therefore, Malevich's painting can be considered as a sort of indirect dialogue between the artist and the author of a painting made by the French writer and eccentric Alphonse Allais in 1882. His painting is called Negroes Fight in a Cave, at Night.